Ed Youngstrom wrote this essay as a class assignment in 1986. 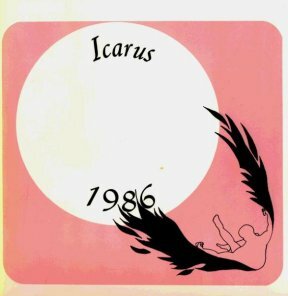 It was later published in "Icarus: The Cadet Creative Writing Magazine" from the USAF Academy. He is currently based in San Antonio with the US Air Force but expects to move to Delaware this fall (1999). The essay is reprinted here with the permission of the author. An Afterward Foreword One interesting point: the last time I met a "new" ERB fan in person was during Desert Storm. My tentmate had a found a hardback with two of the Barsoomian novels printed together (I don't remember which stories) in the books sent to the troops. Since he was rather avant-garde in his other tastes, I was quite surprised. Anyway, we spent a pleasant time retelling our Burroughs' experiences. Rather a strange thing to do with Scuds and Patriots booming around one's head. What would Burroughs have thought? There it is, about a foot over from the right. It doesn’t stand out from the 70-odd others that flank it. Yeah, the paperback binding is half gone, and what’s left only reveals part of the author’s name, the number “3,” and a title about ready to fall off. The rest of the book’s spine is the dirty white glue-tape which is the actual physical binding. Taking it off the bookshelf and laying it on the left side of my notebook, I see a faded cover. It never was truly colorful, but now the pale oranges, yellows, light greens all blur into one with the white lettering. The back cover is cracked and scarred from bending and dropping, and the illustration (the left side of the painting which covers the front) is peeling away from the binding. Opening the treasure chest reveals “Eddie Youngstrom” in big bold printing done with black marking pen on the inside cover, written with more grace than I could ever hope to muster. Mom. She wrote it there when I took the book to school for the first time. As for “Eddie,” I never refer to myself that way anymore (back as a sophomore or junior in high school I decided it was too childish), and now only a few old friends and family keep the name alive. The vital organs of the book are still intact and functional. No dog-ears (can’t put it down anyway, so why mark my place? ), no marks (everything’s committed to memory), no tears (one does not mishandle holy writ). 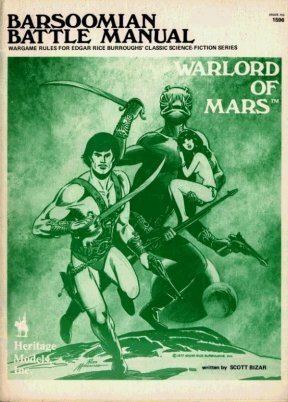 Just 159 pages of my first-and still favorite-novel: Edgar Rice Burroughs’ The Warlord of Mars. Warlord was not the first novel I ever read. But it was my first novel: the characters were people; their world was real; the glaring differences from reality were natural. I lived that book. It was in third period Language class. Mr. Rhodes was droning on about predicates or clauses or something. I had “validated” this lesson by scoring high on a pre-test, one of which was given before every new block of instruction, so I had free time to put to whatever constructive use I could find. Homework? Out of the question. So I wandered back to the two abused wooden bookshelves which housed Mr. Rhodes’ equally abused paperback collection. Something about Mars caught my eye, and I pulled out a book whose cover featured a crudely wrought scene of strange swordsmen frozen in combat aboard and between strangely shaped air-(or are they space-?) ships. Determined to do something other than work, I retreated to my seat and began an adventure which continues up to the present day, seventy years after the book was first published, thirty after the author died, eight after that day in eighth grade Language. I had only read a couple sentences before I recognized the book as one which my father had tried to get me to read a year or so earlier. I had refused, saying that “storybooks” were for little kids, and had promptly stuck my nose back into his book of warships. Regretfully returning the book to the shelf, I went to lunch. Since I lived across the street from school, I was allowed to go home for my meal. Once in the door, I bounced (boy, did I bounce: all 5’2” and 175 pounds of me) straight to a cabinet and pulled out my dad’s more modern edition of Warlord and alternated paragraphs with mouthfuls of lasagna. Unfortunately, I was a slow reader, and I only got a couple pages read by the time I had to get back to school. It was then, while I was washing tomato sauce off my face, that my mother put my name in the inside cover. Once back at school, I skipped the usual lunchtime games and activities. No, I went over to a shady tree and plunged back into my book. No homework that night. No way. Except for dinner, I was with Burroughs all night. I finished the book at school the next morning, but I didn’t finish my appetite for more. Realizing that the book was the third in a series, I proceeded to books 1, 2, and 4-11. My dad had (make that I had) 7 and 9; the rest I got from Mr. Rhodes or the library. Soon after delving into Burroughs’ “Barsoomian” (Martian) series, two things combined to get me to read more. First, Mr. Rhodes assigned an “author report” for which we needed to read at least 3 or 4 books by an author and get up in front of class and talk about such things as the author’s personal writing style, or what his “message” is. Well, since Burroughs was the one and only worthwhile author in the world, I naturally chose him. At the same time I discovered his other worlds: Pellucidar (a world inside the hollow Earth), Amtor (the natives’ word for Venus) and others equally fascinating. I began reading voraciously, for pleasure mainly, with the needs of the report being a distant second. For the first time I wanted to read. I wanted to get involved with the stories. I never wanted one to end. My reading speed multiplied to rates I had never dreamed possible. It took me about 7 hours to read Warlord; The Rider a short (150 page) historical fiction novel set in the Balkans of early twentieth century Europe, took me about an hour. This had the two-edged effect of allowing me to read more, but having the pleasure end sooner. Everywhere I went I had a Burroughs book or two tucked in with my schoolbooks or clutched with a vise-like grip. I read between classes. I read at lunch. I read. And read. And read. For Christmas that year I received several new Burroughs’ books from a father delighted at seeing his son reading. By January (all of this madness started in late November) I had read about 35 novels. After that I couldn’t find any more, so I simply reread everything. All through high school and on up to the present I have been collecting copies of each of Burroughs’ books, occasionally picking up one that I had not yet read. The fate of these “new” books (I almost invariably bought them second-hand) is always the same. I’d find the book in some decrepit used bookstore (usually on the wrong shelf) after spending a couple hours breathing the musty odor of old books. Buy it, get it home, and get set up. I have a system: get a cold drink (lemonade’s best, but a cola will do), maybe some chips, and settle into the most comfortable chair in the house. For the next couple hours, Ed Youngstrom and all his bills, due dates, and emotional baggage are put on hold. Yet, even after all these books (I presently own 61 different books authored by Burroughs), Warlord of Mars remains my favorite. I’ve read the whole series three times, but Warlord has been my reading partner at least eight times. Each new experience with the bank brings out some subtle nuance or tiny detail of Burroughs’ imagination which I somehow missed before. More importantly, each reading brings a couple hours of pure entertainment, darkened only by my total knowledge of what will happen next. For the longest time there was one set of Burroughs’ books (possibly his most famous) that I did not get around to reading: the Tarzan series. I had read Tarzan of the Apes and The Return of Tarzan (the first two books in the series) and Tarzan at the Earth’s Core (a tie-in to the inner world series, but number thirteen in the Tarzan group), but no more. Not until a few months ago did I finally begin reading the remaining books, reaching book six before my classes and duties closed in on me and forced a temporary end to leisure reading. But during the summer, the spare time returned, and so did my eighth grade desire. In the space of nine weeks I bought and read, probably for the last time, a group of “new” Burroughs’ novels-the remaining seventeen books of the Tarzan canon. I have greatly expanded my reading habits since that first infatuation with Burroughs. All kinds of books, from Chaucer and Shakespeare to Heinlein and Tolkien and many in between, have shared my shelf with The Warlord of Mars. But it was that last book which introduced me to the limitless worlds of literature. The main reason that I read is for the entertainment, the escape from the routine of my everyday life. 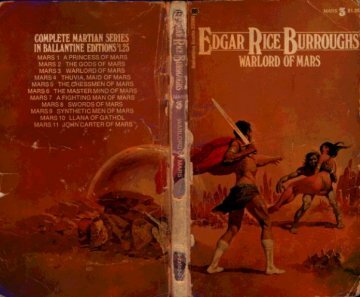 But although I have read more than a few novels in the last eight years, none has ever come as close to fulfilling that goal as the time I first stood next to John Carter and heard the assembled nobles of Barsoom and the people of Helium cheer as he was proclaimed The Warlord of Mars.